The compact Cherrington Models 950 and 800 are versatile, efficient Sand Cleaners, in a compact package. If you have a playground, beach volleyball court or smaller beach that you really care about maintaining, this is a perfect choice for you. Highest quality results: The Cherrington Sand Cleaning system offers significantly better results for your investment. After the sand has been “Cherringtonized” no other method of raking or tine cleaning your playground, court or beach will come close. Like other Cherrington Sand Cleaners, these compact models actually lift the top few inches of sand, screen out debris, and put the cleaned and fluffed sand back onto the beach. There are several interchangeable screen sizes to choose from, and an included automatic grooming comb leaves a beautiful finish on the beach. 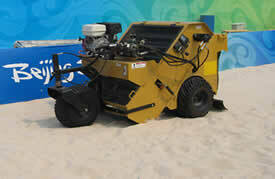 Versatile: These machines offer efficient sand cleaning on straight stretches, in addition working around playground structures, cabanas and beach enhancements is easy for these maneuverable units. Self-contained, Maneuverable, Portable: The Cherrington Models 800 and 950 are compact, can be towed by various vehicles, is easy to maneuver and takes little storage room. We will be happy to tell you more about the Cherrington Sand Cleaners, or reserve a Cherrington for you.